During the Dec. 16 launch from Cape Canaveral Air Force Station, which will send SpaceX’s robotic Dragon capsule toward the ISS, the California-based company will try to bring the first stage of its Falcon 9 rocket back to Earth for a controlled landing on a floating platform in the Atlantic Ocean. The bold maneuver marks a big step forward in SpaceX’s development of reusable-rocket technology, which the company’s billionaire founder, Elon Musk, says could eventually cut the cost of spaceflight by a factor of 100 and perhaps make Mars colonization economically feasible. 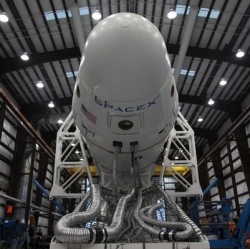 Musk shared photos of the Falcon 9 and landing platform via Twitter late last month, ratcheting up interest in the cargo mission, the fifth of 12 unmanned resupply flights SpaceX will make to the space station for NASA under a $1.6 billion contract. "Autonomous spaceport drone ship. Thrusters repurposed from deep sea oil rigs hold position within 3m even in a storm," Musk tweeted about the platform on Nov. 22. "Base is 300 ft by 100 ft, with wings that extend width to 170 ft. Will allow refuel & rocket flyback in future," he added in another tweet. The Falcon 9 photo revealed that the rocket is outfitted with "hypersonic grid fins" to increase stability during a return to Earth. "Grid fins are stowed on ascent and then deploy on reentry for ‘x-wing’ style control," Musk tweeted on Nov. 22. "Each fin moves independently for pitch/yaw/roll." At a conference at MIT in October, Musk said that SpaceX would attempt to land the Falcon 9 first stage on the floating platform during the rocket’s next flight. The next liftoff on the rocket’s schedule is the Dec. 16 Dragon launch.